Important Dates to note: The office will be closed Friday, August 31st through Monday, September 3rd for Labor Day Weekend. 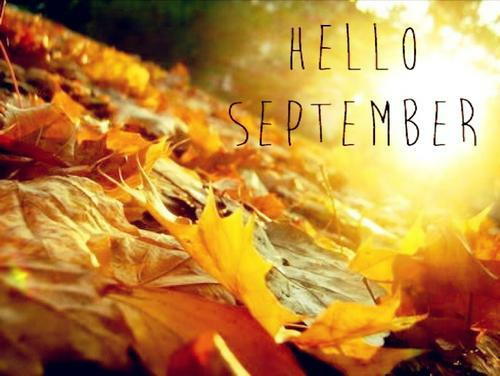 We will also be closed Friday, September 21st. 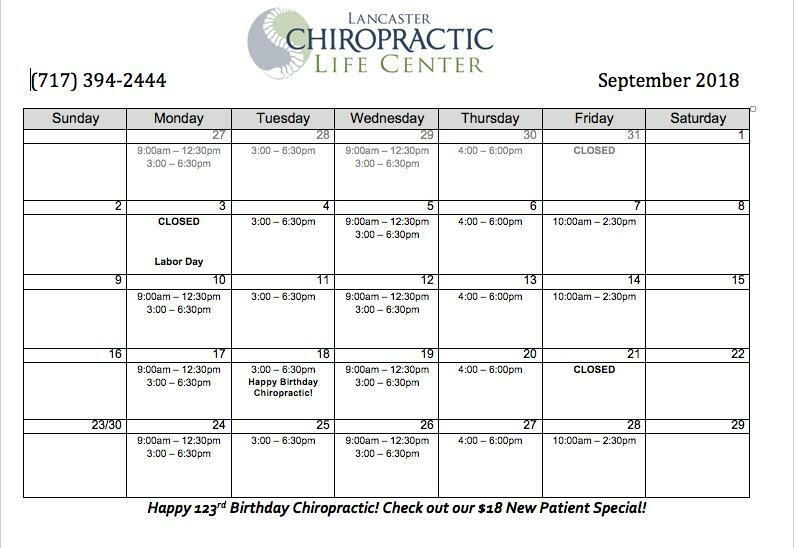 Chiropractic will be celebrating its 123rd Birthday on Tuesday, September 18th. In honor of this special day, we will be offering $18 First Visits for New Patients! Offer will include exam/consultation, thermal scan, x-rays (if necessary), 1st adjustment and report of findings. Offer is valid on the 18th only. We will also have treats to celebrate! Lampeter Fair is Wednesday, September 26th through Friday, September 28th. Make sure to stop by our booth with a friend and say hi! Please note that the office will still be open for our regular adjusting hours during the fair. “Harvey Lillard, a janitor, in the Ryan Block, where I had my office, had been so deaf for 17 years that he could not hear the racket of a wagon on the street or the ticking of a watch. I made inquiry as to the cause of his deafness and was informed that when he was exerting himself in a cramped, stooping position, he felt something give way in his back and immediately became deaf. An examination showed a vertebra racked from its normal position. I reasoned that if that vertebra was replaced, the man’s hearing should be restored. With this object in view, a half hour’s talk persuaded Mr. Lillard to allow me to replace it. I racked it into position by using the spinous process as a lever and soon the man could hear as before. There was nothing ‘accidental’ about this, as it was accomplished with an object in view, and the result expected was obtained. There was nothing ‘crude’ about this adjustment; it was specific, so much so that no Chiropractor has equaled it.” Thus Chiropractic was born! Now imagine if Harvey still needed a hearing aid after September 1895. Your Chiropractor wouldn’t be adjusting you today. Good thing D.D. was a great persuader! In simplest terms, a subluxation (aka Vertebral Subluxation) is when one or more bones in your spine (vertebrae) move out of their proper position and create pressure on, or irritate spinal nerves. Spinal nerves come out from in between each of the bones in your spine. This pressure or irritation on the nerves then causes those nerves to malfunction and interfere with communication pathways traveling over those nerves. Your nervous system controls and coordinates all the functions of your body. If you interfere with the communication pathways, parts of your body will not get the proper nerve messages and will not be able to function at 100% of their innate abilities. In other words, some part of your body will not be working properly. The job of the Chiropractor is to locate and correct them. This is done through a series of chiropractic adjustments specifically designed to correct the vertebral subluxations in your spine. Subluxations are really a combination of changes going on at the same time. These changes occur both in your spine and throughout your body. For this reason, Chiropractors often refer to subluxations as the “Vertebral Subluxation Complex” (VSC). Kinesiopathology – The osseous (bone) component is where the vertebrae are either out of position, not moving properly, or are undergoing physical changes such as degeneration. Neuropathology – The nerve component is the malfunctioning of the nerve. Research has shown that only a small amount of pressure on spinal nerves can have a profound impact on the function of the nerves. Myopathology – The muscle component is also involved. Since the muscles help hold the vertebrae in place, and since nerves control the muscles themselves, muscles are an integral part of any VSC. In fact, muscles both affect, and are affected by the VSC. Histopathology – The soft tissue component is when you have misaligned vertebrae and pressure on nerves resulting in changes in the surrounding soft tissues. This means the tendons, ligaments, blood supply, and other tissues undergo changes. These changes occur at the point of the VSC or far away at some end point of the affected nerves. Biochemical abnormalities – The chemical component is when all these components of the VSC are acting on your body, and therefore causing some degree of chemical changes. These chemical changes can be slight or massive depending on what parts of your body are affected by your subluxations. To be truly healthy, it is vital that your nervous system be functioning free of interference from subluxations. Our goal is to allow your body to return itself to the highest level of health possible by correcting VSC. Chiropractors are the only professionals trained in the detection and correction of VSC.